Prepare the Marinade: Place all of the veggies and herbs in a heavy stock pot or Dutch oven along with the garlic, juniper berries, whole cloves, bay leaves, salt, sugar and peppercorns. Add the red wine, red wine vinegar and water. Bring the mixture to a boil, reduce the heat, cover and simmer for 10 minutes. Turn off the heat and let the mixture cool down completely. Marinate the Meat: Nestle the roast in the vegetable marinade and place the lid on the pot. Let it marinate in the fridge for at least 4 days, preferably 7. (Traditionally, the marinating time is as long as 2 weeks!) Unless the meat is completely submerged under the liquid, turn the roast over once every day. Remove the roast, pat it dry with paper towels, and strain the liquid from the vegetables. Reserve the liquid and the vegetables. Cook the Roast: Rinse the pot out and heat a tablespoon or two of oil in it over high heat. Generously brown the roast on all sides. Remove the roast and set aside. If using bacon, cook the bacon until done. Leave about 2 tablespoons of oil/fat in the pot. Place the strained vegetables in the pot (with the bacon if using) and cook for 5-7 minutes. Stir in the flour, cooking the mixture for a minute or two to eliminate the flour flavor. Add the liquid that you strained from the vegetable marinade, bring it to a boil, stirring constantly to prevent lumps. Add the raisins, honey and crushed ginger snaps. Return the roast to the pot. Bring to a boil, reduce the heat to low, cover and simmer for about 2 hours (may need longer) or until the meat is very tender. When the roast is done, remove and transfer it to a plate, tent it to keep warm, and let it rest for 5 minutes before slicing. 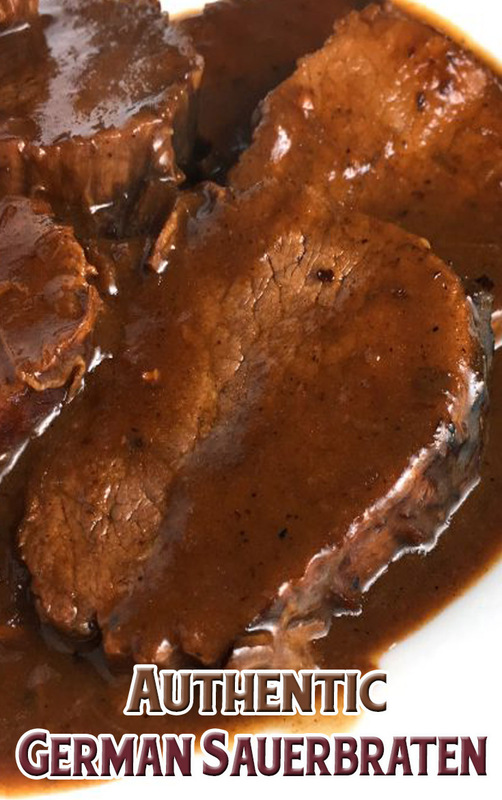 Spoon the gravy over the sliced Sauerbraten and serve immediately.